This November the 22nd will mark the 50th anniversary of President John F. Kennedy's assassination in Dallas, Texas. From the day the Warren Commission released its report and its 26 volumes of testimony and evidence, its critics have been vehemently arguing that Lee Harvey Oswald was not the President's assassin, that more than one shooter was involved, that the CIA/KGB/Lyndon Johnson/Anti-Castro Cubans/the Mafia were responsible, amongst other pertinent issues. However, one issue which has not been carefully scrutinised is the allegation that on the morning of the assassination, Oswald went to the TSBD wearing a dark gray blue zipper jacket, designated as Warren Commission exhibit 163. According to the Warren Commission's mythology, after allegedly assassinating the President in cold blood, Oswald returned to his rooming house at 1026 North Beckley in the Oak Cliff district of Dallas, without the jacket he had allegedly left behind at the TSBD. He then supposedly left his rooming house wearing a light gray zipper jacket. Earlene Roberts, the house keeper at 1026 North Beckley, testified before the Warren Commission that she saw Oswald enter the rooming house "in his shirt sleeves". She further testified that Oswald left the rooming house after maybe about three to four minutes wearing a "kind of zipper jacket" . Roberts was quoted by various sources as giving different descriptions of the jacket Oswald was wearing as he made his way out. For example, she was quoted as describing the jacket as "a short white coat", "a gray zipper jacket", and "a tan coat" . Whilst the quoted descriptions undoubtedly varied, it doesn't necessarily impact adversely on her credibility; as Roberts could simply have been misquoted. What's significant is the fact that in her affidavit to the Warren Commission on 12/5/63, Roberts described the jacket as being "dark color" . 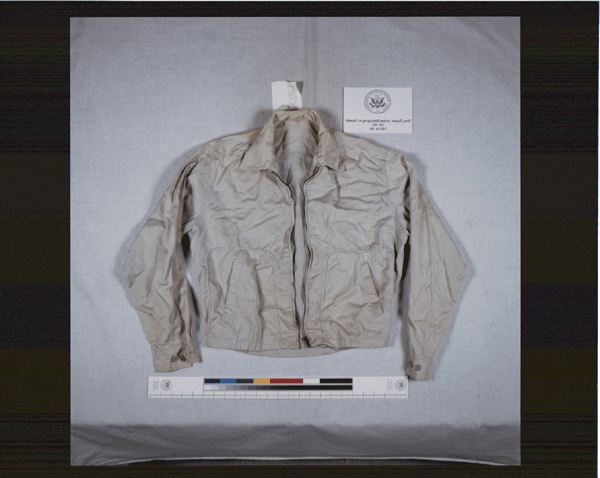 The jacket which Oswald allegedly discarded at the parking lot behind the Texaco Service station, after he purportedly shot and killed Dallas Policeman J.D Tippit, was a light gray jacket (Ce162) . Therefore, Roberts' description is much more consistent with the appearance of the dark gray blue zipper jacket. Well, maybe I have, but I don't remember it. It seems like the one he put on was darker than that. Now, I won't be sure, because I really don't know, but is that a zipper jacket? Yes---it has a zipper down the front. It was a zippered jacket, was it? Yes; it was a zipper jacket. How come me to remember it, he was zipping it up as he went out the door. 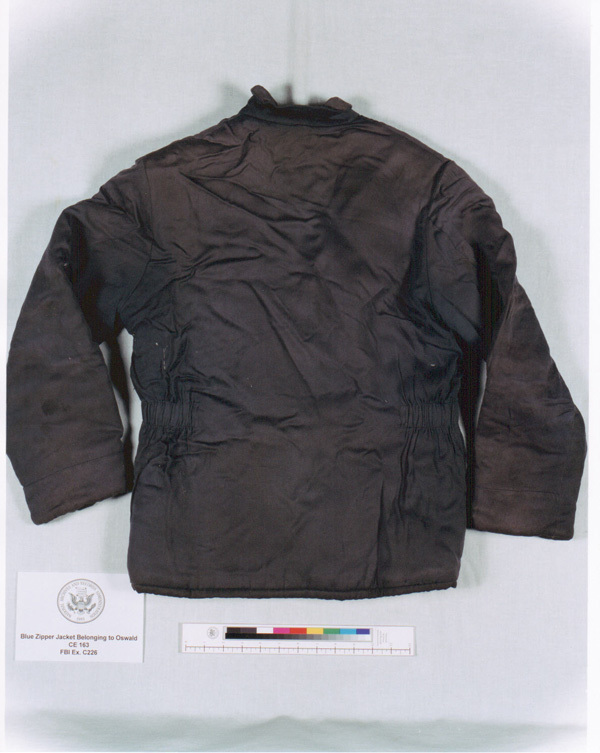 As we can see, Roberts testified that she thought the jacket Oswald left with was darker than Ce162. Whilst the zealous defenders of the Warren Commission will argue that Roberts is not credible because she allegedly provided varying descriptions of the jacket (as stated above), they will ignore that she could simply have been misquoted. 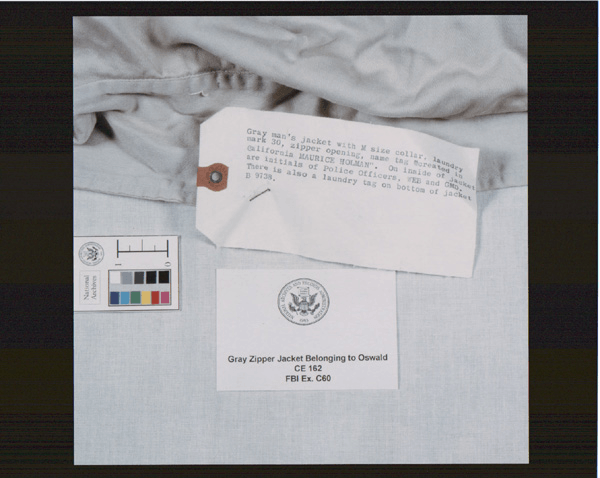 The important point to bear in mind is that it was during her testimony when she was actually shown the light gray jacket; and that in her affidavit made out in her own writing, she described the jacket she saw Oswald wearing as being a dark color. Defenders of the Warren Commission might also argue that since Roberts testified she was completely blind in her right eye, she could easily have been mistaken about the color of the jacket. However, this would only be true if she was color blind in her left eye; and Roberts never mentioned during her testimony that this was the case. Of course, Roberts could simply have been mistaken about the jacket being dark. For example, Barbara Davis, who witnessed the Tippit killer cutting across her lawn, claimed during her testimony before the Warren Commission that the jacket the killer was wearing appeared to be a "dark and to me it looked like it was maybe a wool fabric, it looked sort of rough. Like more of a sporting jacket" . In fact, she went as far as implying that the killer was wearing a black coat! There is one pertinent issue concerning Earlene Roberts' credibility which I should point out. During her interview with the FBI on 11/29/63 , Roberts claimed she observed a Dallas Police patrol car outside Oswald's rooming house, after she heard one of the Officers inside the car honk the horn twice. She identified the number of the car as 207. This car was assigned to Dallas Policeman Jim Valentine, and took Sergeant Gerald Hill (by his own admission) to Dealey Plaza . Warren Commission defenders have criticised Roberts for changing the number of the car from 207 to 107 during her testimony. However, what these dishonest shills don't explain is that Gerald Hill demonstrably lied about how he travelled to the scene of the Tippit shooting in Oak cliff. It is therefore entirely likely that Hill had commandeered Valentine's patrol car and driven to Oak Cliff. It is beyond the scope of this essay to discuss Gerald Hill's complicity in the assassination and framing Oswald; but I encourage readers to read through my two part article on Hill on my blog (click here), and to also read through the discussion I had with researcher Richard Gilbride on Greg Parker's forum (click here) and to decide for themselves whether Hill was lying or not. Suffice it to say, Roberts' account of the Police car honking outside Oswald's rooming house implied that the DPD Officers inside the car were giving him some type of signal; and that they were possibly involved in a conspiracy to murder J.D Tippit with him. In my opinion, no objective minded person would disagree that there wasn't a massive effort by the DPD to discredit Roberts' claim about seeing Patrol car 207. As Richard Gilbride has informed me, at the time of the assassination, Patrol car 107 was out of service, as it was sold in April 1963 but then reactivated in February 1964 . Therefore, by harassing Roberts into changing the number of the car from 207 to 107, the DPD would have succeeded in discrediting her, as she now claimed she saw an out of service Patrol car outside Oswald's rooming house. Despite what one might think about Earlene Roberts' credibility, there can be no doubt that her description of the jacket being darker than Ce162 was highly problematic for the official version of events. If Oswald was indeed a tenant at 1026 North Beckley, then he could have left wearing the dark gray blue jacket to the Texas Theatre. If the jacket had been discovered there following Oswald's arrest, it could then have been substituted for the jacket which actually was discovered at the TSBD; to discredit Roberts' claim of seeing Oswald leaving with the darker jacket. But before discussing the problems with the discovery of the jacket at the TSBD, let's first take a look at the observations of the only two witnesses who allegedly observed Oswald carrying a package on the morning of the assassination. I am of course referring to Linnie Mae Randle, and her brother, Buell Wesley Frazier. As most researchers of the assassination are aware, Frazier drove Oswald to work on the morning of the assassination. In his 12/5/63 interview with the FBI, Frazier allegedly claimed that Oswald was wearing a gray colored jacket on the morning of the assassination . When Randle was interviewed by the FBI on the same day, she also allegedly claimed that Oswald was wearing a gray colored jacket on the morning of the assassination  (Essie Mae Williams, the mother of Frazier and Randle, was also interviewed by the FBI, but she had merely caught a glimpse of Oswald, and did not provide a description of the clothing he was wearing ). It's crucial to keep in mind that in their first day affidavits to the Dallas Sheriff's Office; neither one of them mentioned that Oswald was wearing a jacket. In her affidavit, Randle claimed that Oswald was "wearing a light brown or tan shirt" , whereas Frazier provided no description of Oswald's clothing . 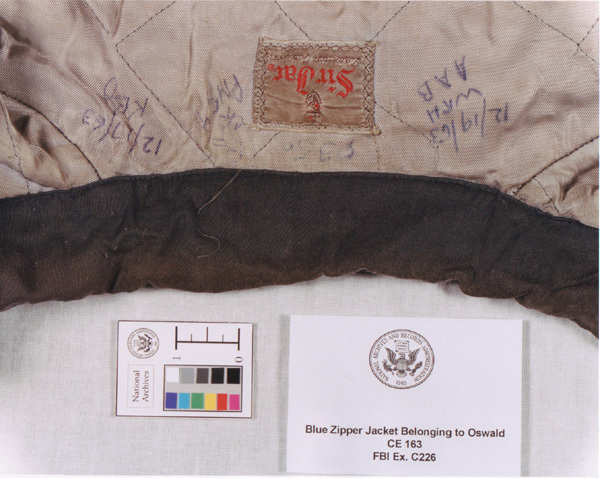 When Randle testified before the Warren Commission, she was shown Ce163 and identified it as the jacket Oswald was wearing on the morning of the assassination . How was Lee dressed that morning? He had on a white T-shirt, I just saw him from the waist up, I didn't pay any attention to his pants or anything, when he was going with the package. I was more interested in that. But he had on a white T-shirt and I remember some sort of brown or tan shirt and he had a gray jacket, I believe. A gray jacket. I will show you some clothing here. First, I will show you a gray jacket. Does this look anything like the jacket he had on? Similar to that. I didn't pay an awful lot of attention to it. Was it similar in color? Yes, sir; I think so. It had big sleeves. Take a look at these sleeves. Was it similar in color? What is the Commission Exhibit on this jacket? Here is another jacket which is a gray jacket, does this look anything like the jacket he had on? No, sir; I remember its being gray. Mr. Ball Well, this one is gray but of these two the jacket I last showed you is Commission Exhibit No. 162, and this blue gray is 163, now if you had to choose between these two? I would choose the dark one. You would choose the dark one? Which is 163, as being more similar to the jacket he had? Yes, sir; that I remember. But I, you know, didn't pay an awful lot of attention to his jacket. I remember his T-shirt and the shirt more so than I do the jacket. The witness just stated that 163 which is the gray-blue is similar to the jacket he had on. 162, the light gray jacket was not. After initially hesitating somewhat, Randle identified the dark gray blue jacket as the one Oswald was wearing. Her explanation that she didn't pay much attention to Oswald's jacket makes little sense. Why would she be paying more attention to the T-shirt and shirt which were both underneath the jacket? Of course, this is the same witness who would claim that she observed Oswald place his package into the backseat of her brother's car. Yet as critics of the Warren Commission have pointed out, Frazier's car was parked on the outside of her carport; and that her view of the car was blocked by the wall of the carport! Certain defenders of the Warren Commission have tried to explain that she had merely heard Oswald open the car door and place the package inside. Despite this cheap attempt to defend their witness, Randle specifically claimed that she saw him place the package into the car. I have here Commission's 163, a gray blue jacket. Do you recognize this jacket? Did you ever see Lee Oswald wear this jacket? No, sir; I don't believe I have. No, sir; I don't believe I have because most time I noticed when Lee had it, I say he put off his shirt and just wear a T-shirt the biggest part of the time so really what shirt he wore that day I really didn't see it or didn't pay enough attention to it whether he did have a shirt on. On that day you did notice one article of clothing, that is, he had a jacket? What color was the jacket? It was a gray, more or less flannel, wool-looking type of jacket that I had seen him wear and that is the type of jacket he had on that morning. Did it have a zipper on it? Yes, sir; it was one of the zipper types. It isn't one of these two zipper jackets we have shown? The fact that Frazier insisted he saw Oswald wearing a gray zipper type jacket, yet at the same time, refused to identify Ce163 as the one he was wearing, raises the distinct possibility that Oswald was wearing a gray flannel-wool jacket to the TSBD, which was then substituted for Ce163. Of course, Frazier's own credibility as a witness is not without question. For example, Garland Slack claimed that he observed Oswald at the Sports drome rifle range, and that he had been taken there by "a man named Frazier from Irving, Texas" (Irving, Texas, was the residence of Linnie Mae Randle, where Frazier was also living). Frazier denied having ever driven Oswald to the rifle range . Richard Gilbride believes that Frazier was responsible for cutting the power to the TSBD elevators from the basement; after he allegedly went there to eat his lunch . Much has also been discussed about Frazier's arrest and possession of a British Enfield rifle, and his polygraph examination by DPD detective, R.D Lewis. Researchers such as Jim DiEugenio have suggested that Frazier may have been coerced by the DPD into incriminating Oswald by claiming that he saw Oswald carrying a package; but he had deliberately stated the package was only about 2 feet long (too short for even a broken down Mannlicher Carcano rifle) to divert suspicion away from himself. Although I find the above scenario to be plausible, it makes no sense that he would refuse to identify Ce163 as the jacket Oswald was wearing, if he was involved in a conspiracy to falsify evidence against him. Of course, there is always the possibility that Frazier was simply mistaken about the jacket Oswald was wearing, and that he really was wearing Ce163. Let's now take a close look at all the problems with the discovery of the jacket at the TSBD. As stated at the beginning of this essay, the dark gray blue jacket was allegedly discovered in the first floor Domino room of the TSBD, by an employee named Franklin (Frankie) Kaiser. In fact, not only is Kaiser credited with discovering the jacket, but he is also the same employee who allegedly discovered the clip board used by Oswald for filling out orders for school books (Kaiser testified before the Warren Commission that he had also made the clip board) . The reader should keep in mind that there were a total of about 76 persons employed by the TSBD . It therefore seems incredibly odd that Kaiser would be the same person to allegedly discover both Oswald's clipboard and jacket. Of course, it cannot be known for sure how many employees used the Domino room; and how many of them also went to the sixth floor as Kaiser did. Even if it was only a grand total of five persons, the odds would roughly be only 4% that Kaiser could have discovered both items. What makes the discovery of the jacket all the more bizarre is the fact that there are two separate FBI reports which provide different dates for the discovery of the jacket! 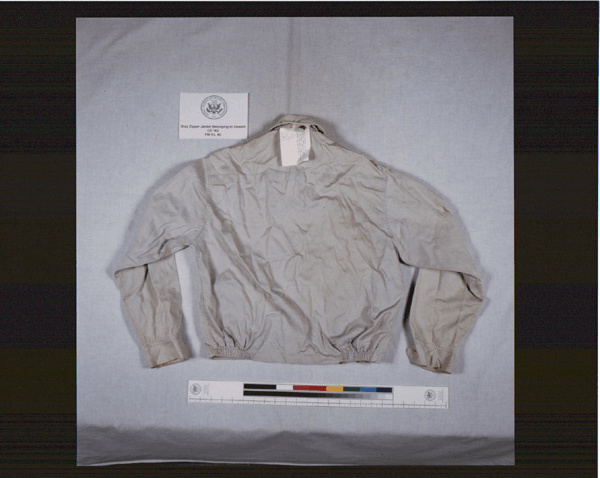 In a report dated 2/8/63, FBI agent Kenneth B. Jackson writes that the jacket was discovered at the TSBD at about 12/16/63 . So not only are we to believe that against all odds Kaiser found both the jacket and the clipboard, but that it also took him close to four weeks to find the jacket. Granted that Kaiser was absent from the TSBD on the day of the assassination, and only returned to work the Monday following the assassination according to his testimony, but surely he or another employee could have found it much sooner than 12/16/63. This now brings us to the second FBI report on the jacket's "discovery". In his 3/7/64 report, FBI agent Robert Barrett wrote that Roy Truly, the superintendent of the TSBD, was given a jacket by an employee whose name he could not remember; three to four days following 11/22/63  – and not on 12/16/63 as per the report by SA Kenneth Jackson written one month before. The reader should make note of the fact Barrett wrote in his report that Truly turned the jacket over to an FBI agent; whose name was not specified. Even if we are to believe that this agent was in fact Kenneth Jackson, why is there a discrepancy in the date on which Truly had given the jacket to the FBI? Perhaps we should also consider Barrett's credibility as an investigator. Many researchers are aware of the allegation by Barrett that a wallet containing identification for Oswald and the fictitious name Alek James Hidell, allegedly used by Oswald as an alias, was discovered at the scene of the Tippit murder. Warren Commission defenders such as Dale Myers believe that Barrett was mistaken about the wallet. If this were true, then it might negatively impact on his credibility. However, there is much reason to believe that Barrett was telling the truth. Those interested in the wallet issue are encouraged to read through my article on my blog (click here). Adding further doubt that Ce163 was not discovered at the TSBD, Roy Truly was not asked a single question about the discovery of the jacket during his Warren Commission testimony . Furthermore, although Kaiser was asked exactly where in the Domino he had found the jacket during his testimony, he was never asked when he had found it! When Oswald's co-worker, Charles Douglas Givens (who told the Warren Commission that he had seen Oswald on the sixth floor of the TSBD at about 11:55 am) was asked during his testimony about the type of clothing Oswald was wearing, he claimed that "he [Oswald] would wear a grey looking jacket. "  Although Givens' credibility is, to put it mildly, lacking, he was also never shown Ce163 to identify it as the jacket Oswald was wearing. There was no identification made by any of Oswald's co-workers, or by Oswald's supervisor William Shelley, that Ce163 was the jacket Oswald was wearing when he went to work on the morning of the assassination. The reader should also bear in mind that in the reports by the DPD Officers, FBI and Secret Service agents (and Dallas postal inspector Harry Holmes) who had participated in Oswald's interviews, there is no mention of Oswald admitting to wearing a dark gray blue looking jacket to work  . Perhaps now we should take a closer look at the man who allegedly discovered the jacket. Frankie Kaiser testified before the Warren Commission that he worked at the TSBD as an order filler and truck driver. When asked the date he started working for the TSBD, Kaiser claimed that it was 8/24/62. When asked why he was absent from work on the day of the assassination, Kaiser testified that he was at the Baylor dental college for an abscessed tooth. As researcher Bill Kelly has pointed out, the Baylor dental college is where George Bouhe arranged to have Marina Oswald's dental work done shortly following her arrival from the Soviet Union with her husband. On a much more sinister note, the Baylor medical clinic had been provided hundreds of thousands of dollars in Army and CIA funds for the heinous MK/ULTRA mind control research from 1963 to 1965. Kaiser's alleged discovery of both the Clipboard and jacket led me to speculate that perhaps Kaiser was a confidential FBI or DPD informant working inside the TSBD, and keeping an eye on Oswald whom, as most researchers of the JFK assassination are aware, was suspected of being a Communist due to his "defection" to the Soviet Union. However, there was also Joe Rodriguez Molina, a former chairman of the Dallas chapter of the American GI forum, who was employed at the TSBD as a credit manager (at the time of the assassination, Molina had been employed at the TSBD for 16 years). As Greg Parker has pointed out, Molina was suspected of having connection to gun runners. Moreover, an FBI informant named William James Lowery; who had been informing on Molina, provided information that four members of the American Communist party had visited Molina's residence. Lowery had also provided information that Molina had attended a political meeting, during which several members and sympathisers of the American Communist party were also present. Although Lowery and other informants would claim that Molina was not a member of, or sympathetic towards the Communist party, the fact they had provided information that Molina was in contact with several Communists would have made him suspect to the FBI, just as the former "defector" to the Soviet Union; Oswald, undoubtedly was. William Lowery is an interesting person for several reasons. On 9/26/63, Lowery made the headlines by outing himself as an FBI "spy" about three days previously when he testified at an open Justice Department hearing in Washington. On the day of the assassination, Lowery was employed as the manager of a shoe store on 620 West Jefferson Street named the Shoe Haven; about three blocks to the West of Hardy's Shoe store where the manager, Johnny Calvin Brewer, allegedly spotted Oswald outside his store looking "funny" and scared, and then allegedly followed him into the Texas Theatre, after which we are told the Theatre Cashier, Julia Postal, telephoned the DPD leading to his arrest. Despite being credited as the man who led to the capture of the accused murderer of the President of the United States, Brewer (and Postal for that matter) was not asked by the DPD to provide a sworn affidavit on the day of the assassination. Witnesses to the President's assassination gave sworn statements to the authorities on the same day, yet Brewer provided an affidavit on 12/6/63 – an entire two weeks following the assassination! During an interview with researcher Ian Griggs, Brewer would claim that when he allegedly spotted Oswald outside his store, there were two men with him in the store who were allegedly from IBM. However, no mention of these men was made by Brewer in his affidavit, his interview with the FBI , and during his Warren Commission testimony. Lee Farley has made the case that one of these so-called IBM men was Igor Vaganov; who was suspected of being involved in the murder of DPD Officer J.D Tippit. Interested readers can read through Mr Farley's work on Vaganov by clicking here. Now, the reader might be curious as to what Brewer has to do with Lowery. Aside from being an admitted FBI informant working as a manager in a shoe store about three blocks to the West of Brewer's store, Lowery would tell HSCA investigators James P. Kelly and Harold A. Rose on 4/28/78 that he thought Oswald was "probably" on his way to kill him for exposing the Communist Party in Texas. In light of all the evidence uncovered through the ARRB on Oswald, the idea that Oswald was a Communist is simply ludicrous. My belief is that, as someone who had admitted he was an FBI informant, Lowery made up that claim to make it appear as though Oswald had confused Brewer's store with his store; which would give credence to Brewer's story of spotting Oswald outside his own store. There is another interesting indirect connection between Lowery and Brewer. As Lee Farley has noted, in August of 1962, Lowery and the rest of the American Communist Party members in Dallas were promoting the idea of further establishing their connection to the local American Civil Liberties Union. The reader should note that both the highly suspect Ruth and Michael Paine were members of the ACLU  . Although Oswald had allegedly applied for membership with the ACLU , Greg Parker has informed me that Oswald was actually a member of the Dallas Civil liberties Union – an affiliate of the ACLU. It is beyond the scope of this essay to discuss the intelligence connections of Oswald and the Paine's. However, their presence in the ACLU is understandable given the fact that the Communist party were trying to establish closer ties with them. Quite coincidentally, John Brewer would testify before the Warren Commission that he went to work as manager of Hardy's shoe store in August, 1962. So how does all this relate to Frankie Kaiser? The reader will note that in the 8/20/64 FBI report on Joe Molina, the identity of Dallas informant, DL T-3, was kept hidden (DL T-3 was also informing on Oswald) . The FBI was allegedly concerned that revealing the identity of DL T-3 would compromise his future "effectiveness" as an informant. Although this is just speculation on my part, I believe that DL T-3 was in fact Frankie Kaiser. We have already seen that Kaiser had taken the credit for the discovery of the clipboard and jacket, and there are a number of coincidences which give credence to the possibility that Kaiser was DL T-3. Kaiser's discovery of the clipboard was allegedly made on 12/2/63. On the very same day, an FBI agent named Nat Pinkston was supposedly ordered by one of his superiors to conduct an "investigation" at the TSBD. The purpose of this investigation and the name of the supervisor were never revealed during Pinkston's testimony, or in his report concerning the clipboards discovery. The only thing Pinkston revealed when he testified was that he was waiting to see Roy Truly (this raises the possibility that it was Pinkston who acquired both the jacket and clipboard). Oddly enough, on the exact same day that Pinkston went to the TSBD to conduct an "investigation", DL T-3 was shown a photograph of Oswald by an unnamed FBI agent. The informant went on to state that he had recognised Oswald as being the same person he had come into contact with on business. Perhaps this is referring to the fact that on 8/13/63, 8/20/63, 8/27/63 and 9/3/63, DL T-3 was responsible for handling Oswald's IB-2 form. However, the possibility exists that the "business" in question was the TSBD. It is also interesting that the FBI had collected specimen from DL T-3 on 12/16/63 and 12/17/63 according to Warren Commission exhibit 2444. The reader will recall that the date on which the jacket was acquired from Roy Truly was 12/17/63 according to the report by SA Kenneth Jackson, with Frankie Kaiser being the person who allegedly gave the jacket to Truly. There is absolutely nothing solid as far I am concerned which proves that Kaiser was DL T-3. However, the presence of an FBI informant at the TSBD makes perfect sense given that suspect individuals such as Oswald and Molina were employed there. As I've stated before, Kaiser testified that he went to work at the TSBD on 8/24/62 – this is the exact same month in which William Lowery and the rest of the American Communist party members in Dallas were attempting to establish closer ties to the ACLU. It is also the exact same month in which Johnny Brewer began working as the manager of Hardy's shoe store on Jefferson Blvd. This could all be just an incredibly bizarre coincidence, but my belief is that Lowery, Brewer, and Kaiser were all part of an FBI operation to keep watch on suspected Communists in Dallas; with Kaiser gaining employment at the TSBD to keep an eye out on Molina, and eventually on Oswald when he began working there. The reader should keep in mind that on 10/9/63; just one week after Oswald allegedly returned from Mexico City after contacting Valery Kostikov (the KGB agent who was suspected of being in charge of assassinations in the Western hemisphere), and one week prior to commencing employment at the TSBD with the help of Ruth Paine, FBI supervisor Marvin Gheesling removed the FLASH warning on Oswald. Had Gheesling not done this, the Secret Service would have ensured that Oswald was not working in a building along the President's parade route. Researchers have been baffled as to how Oswald was still not considered a Communist threat following his departure from Mexico City. If the FBI knew in advance that Oswald would be employed at a building with one its informants working there, then surely there would be no problem in having the FLASH removed. This then raises the possibility that the FBI had played a role in securing Oswald a job at the TSBD, through one or more of its informants at the Texas employment Commission, such as Robert Adams. There is still another possible connection between Oswald, Molina, and the FBI. A man named Osvaldo Iglesias claimed that he had identified Rodriguez Molina; "the man arrested for questioning with Oswald in Dallas. " as the person passing out leaflets with Oswald in New Orleans. Joe Molina's middle name was Rodriguez, and on the morning of 11/23/63 the DPD had paid his home a visit and searched through his belongings. Molina was not arrested, but the next day, he went to the DPD upon their request where he was questioned by Captain Will Fritz. As far I know, there is nothing to substantiate Iglesias' claim. However, it is yet another intriguing possibility that Molina was indeed a Communist sympathiser. Despite whether one believes that Kaiser was a confidential FBI informant, he remains a very interesting person. His so-called discovery of the clipboard remains a mystery on its own. Kaiser testified that it was lying on the floor and in the plain open (the reader is advised that film footage from WFAA-TV had apparently captured a DPD Officer handling the clipboard on the sixth floor of the TSBD on the day of the assassination) . As the great late Sylvia Meagher noted, Kaiser's "discovery" of the clipboard occurred on the exact same day on which Charles Givens first told a Secret Service agent that he had seen Oswald on the sixth floor with his Clipboard. Could this really be a coincidence? Warren Commission defenders have used this as evidence that Oswald was the last known employee on the sixth floor. Of course, they ignore all the problems with Givens as a witness. I also encourage readers to read through a copy of issue 5 of volume 4 of the third decade by Dr Jerry Rose (click here). In his article, Dr Rose discusses Oswald's application for a job at the Allright parking system lot on Commerce Street in Dallas. When a detective went to investigate this application, he discovered that a person named Fred Kaiser Jr. had applied for a job there. As Dr Rose also explains, the man claimed he quit his job at the depository on 11/21/63. The man gave his address as Ledbetter Street – the same address Frankie Kaiser provided for himself during his Warren Commission testimony! Dr Rose speculates that perhaps Fred Kaiser was in fact Frankie Kaiser who quit his job at the TSBD, only to be brought back for the purpose of "finding" the clipboard. There is one final important point I would like to make. If Kaiser was an FBI informant, there is no chance on Earth J. Edgar Hoover would admit to this, as it would be a severe embarrassment to him and the FBI that one of their own informants was employed in the same building in which Oswald, the man arrested and accused by the DPD for assassinating the President, was also employed in. I doubt that even the most ardent of FBI and Warren Commission defenders would honestly disagree with that point of view. Lee Harvey Oswald did not wear Ce163 (the dark gray blue jacket) to the TSBD on the morning of the assassination. Instead, Oswald wore a flannel-wool looking jacket as Buell Wesley Frazier testified. 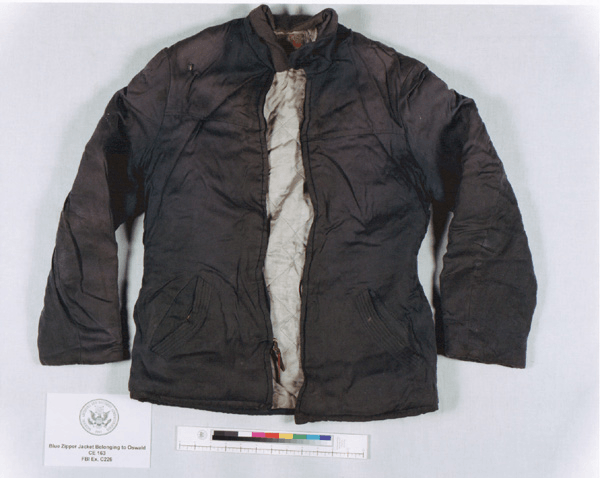 This jacket was discovered three to four days following the assassination (as per the report by SA Robert Barrett) inside the Domino room by an unidentified employee. The jacket was then made to disappear; with the identity of the employee who found it kept hidden. After Earlene Roberts described the jacket Oswald was wearing when he left 1026 North Beckley as being "a dark color" to Secret Service agents William Carter and Arthur Blake in her affidavit to them on 12/5/63, the authorities conspired to discredit her by faking the discovery of Ce163 on 12/16/63 by Frankie Kaiser at the TSBD. I believe it's possible that Oswald wore Ce163 to the Texas Theatre, and that it was then substituted for the flannel-wool jacket found at the TSBD. 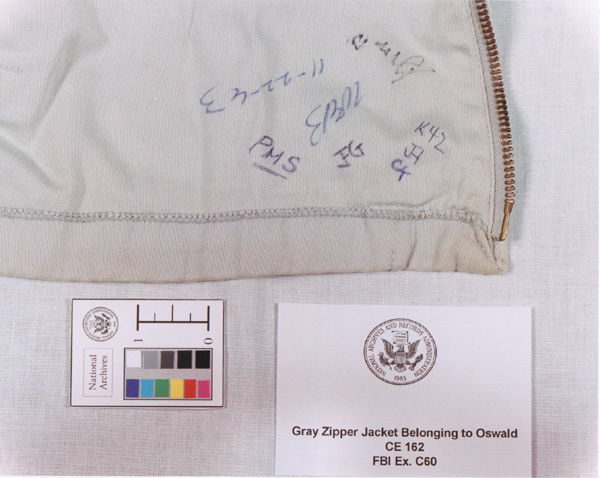 Without a doubt, Roberts' failure to identify Ce162 (the light gray jacket) as the jacket she saw Oswald wearing was a problem for the case against Oswald for shooting Officer J.D Tippit; as she was the only witness who positively saw Oswald (and not someone else) with a zipper jacket, and a zipper jacket was discarded at the parking lot behind the Texaco service station. Warren Commission defenders of course will scoff at any notion that the authorities were out to frame Oswald for the murder of the President and J.D Tippit. However, consider that with the President of the United States arrogantly and brutally gunned down in full public view and in broad daylight; and with the entire world anxiously waiting to learn who was responsible; and with the possibility of a nuclear war in the wake of the assassination, the DPD and the FBI would undoubtedly have been under a great amount of pressure to find those responsible. The DPD had apprehended Oswald at the Texas Theatre after he left the TSBD – the same location where they had discovered the rifle and spent shell casings. They therefore had a viable suspect for the assassination. The reader should also keep in mind that Julia Postal overheard one of the Officers who arrested Oswald at the Theatre remark "We have our man on both the counts" , and Johnny Brewer testified that he allegedly heard one of the Officers yell out to Oswald inside the Theatre "Kill the President will you" as they were scuffling with him. I only hope that current and future researchers will delve further into the issues which I have discussed throughout my essay. I would like to thank researchers Greg Parker, Lee Farley, and Richard Gilbride, to all of whom I owe this work. Without the help and support they have provided me, I doubt very much that I would have been able to write this essay. Researcher Tom Scully has brought to my attention the fact that Frankie Kaiser and Fred Kaiser were actually brothers living at the same address in Dallas; and both of them were employed at the TSBD prior to President Kennedy’s assassination. The information is from an investigation by DPD detective, W.S Biggio, into Oswald’s application to work at the Allright Parking System on 1208 Commerce Street, Dallas, Texas. According to information provided by Garnett Claud Hallmark, general manager of the Parking System, the application by Fred Kaiser to work at the System listed 5230 W. Ledbetter Street as Kaiser’s address; the same address which Frankie Kaiser provided for himself during his Warren Commission testimony. In fact, a Frankey Kaiser was listed by Fred in his application as an emergency contact; with Frankey’s address given as 5230 W. Ledbetter Street. When former TSBD employee Roy E. Lewis was interviewed by Larry Sneed for Sneed’s book, No More Silence, he informed Sneed that amongst the workers at the TSBD he knew were the Kaiser brothers. It is therefore readily apparent that I was wrong in assuming that Fred and Frankie Kaiser were the same man, and I apologise to readers for my error. Research by Greg Parker, Spartacus education forum, Joe Molina's connections to gun-runners topic. Dallas municipal archives, Box 18, folder 7. No More Silence by Larry Sneed, page 85.